The Odd Omission in IPCC's Summary for Policy Makers for SREX on Extreme Weather and Climatic Events | Watts Up With That? One of the major reasons why extreme weather events are of abiding interest to both the public and policy makers is the potential loss of life that they can cause. Imagine, therefore, writing a “Special Report” on managing the risks of extreme weather and climatic events but being virtually silent on whether deaths from such events had increased or decreased over the recent past. Who knows, but that information might even be useful in helping identify factors that could help manage those risks in the future. Yet, the Summary for Policy Makers (SPM) of the IPCC’s Special Report on extreme weather and climate events (SREX) does precisely that. “Fatality rates and economic losses expressed as a proportion of GDP are higher in developing countries (high confidence). During the period from 1970 to 2008, over 95% of deaths from natural disasters occurred in developing countries.” (SREX SPM, pp. 5–6). More importantly, the SPM SREX fails to inform the public and policy makers that, as many readers of this blog probably know, empirical data show that deaths and death rates from extreme weather and climatic extremes have declined over the past few decades (Figure 1). Figure 1. Global deaths and death rates from extreme weather and climatic events, 1900–2010 Source: Goklany, Wealth and Safety: The Amazing Decline in Deaths from Extreme Weather in an Era of Global Warming, 1900–2010. This is very much like writing a treatise on the impacts of climate change on agricultural yields but failing to mention that agricultural yields have, as shown in Figure 2, increased more or less steadily for the past half century—oh, wait, the IPCC has done this in each of its reports. Figure 2. Cereal yield and production, 1961–2008, for Least Developed Countries (LDCs) and globally. Source: Food and Agricultural Organization (2010). By contrast, the SREX SPM deals at substantially greater length with economic losses than with losses of human lives. But which is more important—lives or economic losses? It is conceivable that the full report (which is unavailable to the public) gives more space to empirical data on deaths and death rates but I suspect most people—and, certainly, policy makers—will not read beyond the SPM. But policy makers are owed basic empirical information on what is the problem and whether the problem has been getting better or worse before being presented with speculative model results (which are addressed at great length). Such information would provide context, and raise at least a few important—and inconvenient—questions. Second, are empirical trends for the losses of life consistent with model projections? If not, why not? And can these models reproduce past trends? Third, if deaths have declined despite any global warming, what is it that we are doing right, and how can we ensure we keep doing it? George Santayana is quoted as having said “Those who do not learn from history are doomed to repeat it.” Sometimes history is worth repeating. 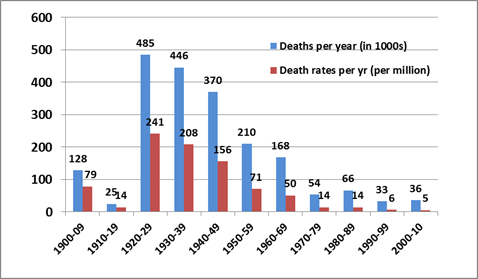 Certainly, we could do worse than repeat history with respect to trends in deaths/death rates from extreme weather events. How long can the IPCC keep going surley it jumped the shark after cop15? Roger Pielke Jr. has some several insightful and interesting things to say about this too. Worth a read. Seriously now, how forthcoming do you expect these people to be? They know they will be hammered no matter what they do. I am not suggesting that no justification for hammering them will be present. They will get it from both sides so being political people they will try and please the greater power group. Policy makers want to know dollars, lives are simply expendable when it comes to lining your own pockets and keeping yourself in office. That’s because they haven’t made up their data yet. Would the big Tsunami in Malaysia, rate as a natural climatic event. Or earthquakes. Didn’t they try to tie these in at one time to ‘climate change’. How well does the decline in death rates from extreme weather events correlate with the increase in CO2 over the same time period? Could it be that increasing CO2 saves lives? There is more evidence for that than there is for CO2 causing more extreme weather. On the subject of earthquake fatalities this passage from Wikipedia might be of interest. I cannot imagine how there could be a connection between climate change and earthquakes (although a lack of imagination does not prove anything). However the devastating losses caused by the 1556 and 1976 earthquakes in China should discourage people from linking earthquakes and climate change. The IPCC only ever,ever release “data” showing the negative effects of “global warning”. In all the years I have taken an interest in the biggest scam ever to have been perpetrated on mankind, I have never seen or heard anything positive about AGW. The closest was that we would have vineyards here in NE England in 2025, but, and there is always a but, southern Europe and Africa would be uninhabitable due to drought and extreme heat. They seem to have a never ending supply of scare tactics. 2011 a big year for geological events have these UN IPCC people no shame. Anything to create an uptick. @louis you would probably find that there would be a strong correlation between fuel use per capita and survival rates. Example a category 5 cyclone slams into Queensland and -1 death is reported. However, to admit that might mean admitting that using fuel actually has benefitted humanity. Hmmm i wonder what the comparative stats on that would be. Jason F. @ 10;05 pm: It was 50 million climate refugees by 2010, as forecast by the UN in 2006. None of ’em have been passing my home. One of the main problems imposed by bad weather/heavy rain is flash flooding which in many cases is easy though costly to mitigate against. Flooding over flood plain, though a common problem can be reduced by the correct river maintenance, dredging in other words, which again is costly. All flood mitigation is costly and seldom carried out because tax payers see no obvious benefit in the period after the work is carried out. It is only after heavy rain that the cost benefit can be appreciated. a bit of a panic has set in amongst the CAGW crowd. the IPCC has written the entire summary with the sceptics in mind. that the sceptics will notice lack of supporting data does not matter, because the IPCC’s audience is elsewhere, with the pollies/MSM/scientists who will make of it what they will, in order to keep the scam going. Better communications and learning from the past. Deaths from the 1927 tropical storm in Vermont – 84. Deaths from the very similar Tropical Storm Irene in 2011 – 4. In 1927 people found out about the flood danger when the water came in their door. In 2011, with forewarning, people in flood prone areas moved to higher ground (which takes between 2 and 5 minutes in most of Vermont). And, being perhaps a bit less obtuse than people in some other areas, Vermonters often didn’t rebuild in the exact same places after the 1927 storm — except the roads and bridges — which, surprise, washed out in 2011 just like they did in 1927. Dear Willis, aka Thorn in the Flesh… or mebbe just Saddle Burr? Please ignore my “Dear Willis” line above. The sentiment remains (admiration) but I cross-threaded it. Apologies. Hmmm, extreme weather events is supposed to cause crop losses, yet yields in the less developed countries are sill going up. More people, fewer deaths. More crops, fewer loses. We appreciate you putting the facts on the table in numerous venues. The IPCC and the pro-AGW set claim more disaster, more disaster, more disaster. Yet the data says there is less and less impact and a more improved environment over and over again. They have a problem sorting out factual information from what their emotions want it to be. Just off the top off my head, but historically, doesn’t the increase in CO2 levels coincide with dramatic improvements in life expectancy and living standards? Now that would a nice hockey stick graph to put on a t-shirt! Policy makers already know how to protect lives and property. The sticking point, as always, is where to get the money. CAGW is just a means to an end, having nothing to do with truth, science or facts. Despite what the AGW crowd and the IPCC think, we can’t now, nor will we be able to in the future, stop or modify the severity of hurricanes, tornadoes, floods, and all other NATURAL phenomena. Fortunately, because of satellite surveillance, better forecasting and better communications, deaths from natural disasters like hurricanes, floods and tornadoes are decreasing. That’s the positive side. Unfortunately, because of stupidity and arrogance, economic loss from hurricanes, floods, tornadoes, etc. is increasing. We can tell people to get the heck out of town in time for them to escape injury or death (at least those who listen), but we persist in building in areas prone to damage from these catastrophic natural events. Perhaps not the earthquake itself but the aftermath can be changed. An earthquake can trigger mudslides, for instance, and the severity of those depends on how wet the soil which in turn depends on recent rainfall amounts. Or an earthquake can trigger power outages and in extremes of heat or cold people die from exposure. Underwater earthquakes produce tsunamis and of course every bit of sea level rise gives the tidal wave a bit more reach inland. Granted it’s a stretch of the imagination but the climate does influence the difficulty in dealing with the secondary effects of an earthquake or even magnification of the primary effect in some cases. Where imagination fails for me is climate causing more or fewer earthquakes or making the magnitude more or less severe. I would hazard a guess that a large proportion of landslides are caused by heavy prolonged rainfall which would certainly be relevant. Just saying. When President Obama was running for office, he mentioned the weather disaster in Greensburg Kansas as having 10,000 dead. My cousin who lives there as I recall said it was 11 or 12. Weather “disasters” are now used for political leverage. Weather disasters are abused in terms of accuracy of information and causes. I am sad to see that weather has extremes and is churned into drama. It is not at all costly. As my Geology Prof said “Building your home IN a river is the decision of a fool and the 100 year flood plain IS the river.” Nature gives “Darwin Awards” to fools. The rebuilding of New Orleans when the USA has plenty of land is typical. Holland has no choice and takes flood mitigation and maintenance very seriously. I would never trust the buffoons politian in the USA to do the same. Nice find. It was simple data like the trends in mortalities from extreme weather that led to the demonization of Bjorn Lomborg. The CAGW/zero pop/zero growth crowd lose their legitimacy when the bigger picture is looked at. I am glad you mentioned that. I almost forgot. Look at the crops especially in the “Least Developed” countries (black line) it is almost flat but with a slight upward trend especially towards the end. CO2 perhaps??? More overall warmth in SST??? Good hybrid seed from the USA would not be affordable or even appropriate especially if it needed commercial fertilizer, pesticides and irrigation. 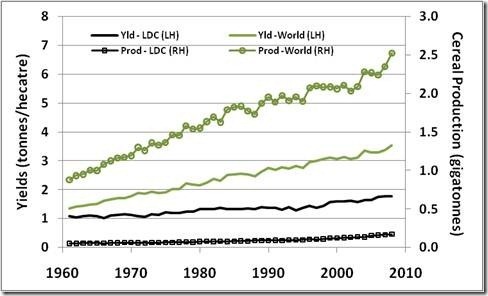 Take a look at Bob Tisdale’s graph in his recent WUWT article and the crop yield graph. I really doubt the upward trend was a change in farming methods because that is why they were separated out in the first place. What is really interesting is, at least in the USA, most of the major farm tech advances were made by 1970 or so yet the increase in crops is pretty much linear. Why are we seeing this? Was it a “managed” effect? 1960 – One farmer supplied 25.8 persons. Irrigated acres: 50,350,000 in 1978 and DECLINED to 46,386,000 by 1987. It was not there the last time I looked at the page and some of the recent “unflattering” information about the 1990’s has been removed. (In 1995 the WTO agreement on Ag was ratified) George Orwell’s Ministry of Truth strikes again! As was alluded to in other posts here, the main reason why the economic losses are on the rise is because we humans keep building more and more in areas that are prone to these disasters. Just because a flood plain may be largely dry 99.99% of the time, it doesn’t mean it’s a smart thing to build one’s home there. Just because hurricanes only hit the Gulf and Atantic coastal regions occasionally, it doesn’t mean it’s a smart idea to allow increases in the development and populations of those coastal regions. As I recall, New Orleans was built where it was because the location was (and probably still is) good as a seaport. Although moving the city to higher ground obviously makes sense, the massive cost and disruption in lives and commercial business probably makes it unfeasible unless it was done in a very slow, planned and cost effective manner over many decades. And then you need to find the land for relocation as well. Only the structures and facilities needed for the seaport would stay where they are. Unfortunately, with the economy the way it is, the cost of such a massive project makes it out of the question. At any rate, the city pays the price for being below sea level and will continue to do so in the future. At least we are starting to wise up by doing such things as building homes and other structures in Florida with hurricane-resistant concrete brick instead of wood. And earthquake resistant technologies are now an important part of building codes in California. In flood plains, houses should be required to be on stilts as they are are in tropical and subtropical areas prone to hurricanes. What is perhaps the biggest issue in all of this thought is that we taxpayers often end up being stuck with the bill when these disasters happen. Although I concur with the idea of bring that to an end, politics probably makes that unlikely to happen anytime in the forseeable future. I can only hope that we humans continue to wise up and realize the need to better anticipate and plan for these disasters as they happen. What is need for the IPCC that is not being done elsewhere except for promoting climate change and where are they accountable? Is the UN an international political organization and if so is the IPCC accountable to that political organization? The IPCC has been reporting a crime they cannot prove has occurred and should be prevented from bearing false witness by identifying mankind in the lineup as the cause. They should also be prevented from operating their fortune telling booth and practicing divination. The panel was first established in 1988 by the World Meteorological Organization (WMO) and the United Nations Environment Programme (UNEP), two organizations of the United Nations—an action confirmed on 6 December 1988 by the United Nations General Assembly through Resolution 43/53. Without an objective evaluation of risks vs. benefits of greenhouse warming these IPCC reports are not in-and-of themselves sufficient for making policy decisions. The IPCC focuses primarily if not exclusively on the potential negatives. Policy decisions need to weigh risks and benefits and what impacts various courses of action may have. There’s no balance at all in global warming research. There are incredibly large benefits from increased atmospheric CO2 and no attempt whatsoever to quantify those. Rough estimates are 15% to 30% higher agriculture output due to an extra 100ppm CO2 in the atmosphere and that’s not counting the lower irrigation requirements or longer growing seasons. The downsides are miniscule in comparison and to make matters worse those downsides exist only in computer models with no empirical support whatsoever. The whole global warming movement is nothing but rent seeking scientists and politicians taking advantage of gullible idealists, primarily naive young people and 1960’s hippy-dippy retreads who never grew up, whom they convince are part of a movement to save the world. It’s sickening and a great many people who are not so gullibe or collect no rent from this charade see right through it. That’s the bottom line and it isn’t going to change in favor of the rent seekers or the ideologues. The jig is up. The emperor is wearing no clothes. Why are geophysical events—earthquakes and landslides—included in the death tally in this climate change report? But tsumamis like Indonesia and earthquakes like Japan ARE linked to global warming. It’s GAIA’s way of punishing us for hurting her. And there do seem to have rather a lot of them on the news recently, it must be linked to global warming. And how many deaths occur worldwide because of cold weather in places where government policies have made energy so expensive that people cannot heat their homes? yeah, right. It was the fictional extra 3mm of sea level introduced into measurements to account for deepening ocean basins that breeched the sea wall at Fukupshima. And look where that led us. The designers could not have anticipated that one day the sea would be above sea-level could they? …. However, to admit that might mean admitting that using fuel actually has benefitted humanity. Hmmm i wonder what the comparative stats on that would be. All you have to do is look at the increase in yield in tonnes per hectare in Figure 2. 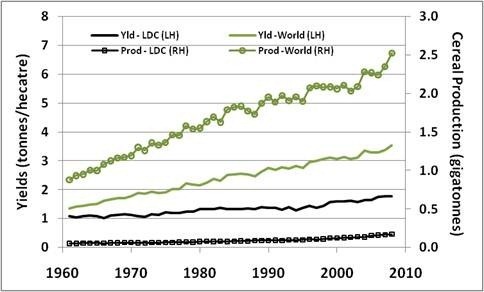 Cereal yield and production, 1961–2008, for Least Developed Countries (LDCs) and globally. “Traditional” low tech (no fuel) farming yields between less than 0.5 ton to at best 2.0 tonne per hectare. Modern farming methods, using fuel and petro-chemicals boost that yield to 7 tons per hectare and that does not include all the labor used in just growing enough food to survive! 1987 – 3 labor-hours required to produce 100 bushels (3 acres) of wheat with tractor, 35-foot sweep disk, 30-foot drill, 25-foot self-propelled combine, and trucks. In 1790, Farmers made up about 90% of labor force. By 1840 with the new farming inventions and the use of factory-made agricultural machinery (TAKES ENERGY!) farmers were down to 69% of labor force. This tells us that a “Low Energy” economy can only support about 25% of the current world population at best, AND 50% of that population will have to return to farming. Since the farmland is being bought up world wide (see farmland grab) that reduces most of us to the equivalent of serfs. We are talking about Neo-feudalism and I doubt the supermarket predators “Occupying Wall Street” realize how HARD farming actually is. I am over sixty and hubby is 68 and we routinely work teenagers and twenty year olds into the ground. The IPCC only exists to perpetuate its own existence and continue exerting geo political control in the field of climate change. When the IPCC pretends to take a more realistic and pragmatic view of AGW it is only a side-stepping chess move in mitigation of mounting criticism and the financial crisis. @Barry- Yes, they did say the tsunami was worse because of the sea level rise. I’ll tell you one thing, from living at the beach for the last 20 years in Costa Rica, there has been no change that I can see of the high water mark. I have no doubt the folks in Indonesia noted no change either so, what was the contributing factor again? Could it be increased tourism and that many more people living near the beach? No, something so simple couldn’t be the reason for those that need to prove preconceived notions and agendas! One thing they forgot to mention was all those new deaths from malaria due to the spread of the mosquito’s range because of climate change! I’m sure they’ll pick up on it for the next report when they need to pad the numbers with something new and improved! I happen to live on the shore of a 20,000 acre manmade lake. I own acreage above and within the 100-year flood plain as well as acreage up to 90-feet below conservation pool level. The 100-year flood plain is a moving target. In the 1930’s when the lake was planned and impounded the 100-year flood plain was determined to be 691’msl. People built houses just above that level. In 1975 the Army Corps of Engineers raised the 100-year flood plain to 715’msl. In 2008 they raised it once again to 722’msl. I’m sure glad I built my house with the lowest floor at 780msl. That’s well above the top of the dam and if I get flooded it won’t be before about half of the city of Austin, including the entire downtown area, the capital buildings, and the University of Texas, has been relocated into the Gulf of Mexico. Going by the original 100-year flood plain at 691’msl there have been three 100-year floods in the 12 years I’ve owned the property. I think people have a very poor understanding of what a 100-year flood plain actually is and the Army Corps of Engineers has a rather poor history of figuring it out accurately because river conditions, including amount of runoff, change over the years. Change in impervious cover almost anywhere upstream or within the immediate drainage basin are particularly effective in raising 100-year flood plains. Everytime impervious cover is added there is that much more rainfall that turns into runoff to raise river and lake levels and that much less that soaks into the ground and goes towards recharging underground aquifers. The so-called 100-year floodplain is a moving target and the target is almost always moving upwards. You can’t really blame people who took Army Corps of Engineers at their word when they initially establish these flood plain boundaries. Everything I locate at an elevation below the top of the spillway is either built to be moved to higher ground as needed, will float during a flood, or can be inundated without damage. Interestingly, as we speak, there is stone and cement picnic table and fireplace about to rise up out of the water on my property that hasn’t seen the sun since the 1950’s. There was a ten-year long drought back then that kept the lake level low enough for long enough to inspire previous users to build an entertainment area closer to the shore which has now retreated from where it is at conservation pool level by about 400 feet. Policy makers/bureaucrats are only interested in protecting their butts and raking in MONEY for themselves and their friends. The true statesmen are very few and far between. They are either riddiculed and sidelined or if all else fails shot/poisoned or whatever. Protecting lives and property is completely incidental to the core agenda as shown by the EU/Tony Blair 2001 – foot & mouth disease FIASCO the FEMA – New Orleans DEBACLE and the Gulf oil spill with Obama preventing Dutch ships from helping. Then there is the recent report that 80% of all the money loaned out by the Department of Energy went to Obama’s backers. Not that that is something new. ….More than two years after President Obama took office vowing to banish “special interests” from his administration, nearly 200 of his biggest donors have landed plum government jobs and advisory posts, won federal contracts worth millions of dollars for their business interests…. Smaller government close to home with the ability to recall politicians is the only possibility of keeping these predators close to honest and that is only if we are diligent in keeping an eye on their antics. We relied on the Media to act as watch dog which is why J.P. Morgan set out to gain control of the news in 1917. We have been fed propaganda not news since. Congressman Calloway announced that the J.P. Morgan interests bought 25 of America’s leading newspapers, and inserted their own editors, in order to control the media…. 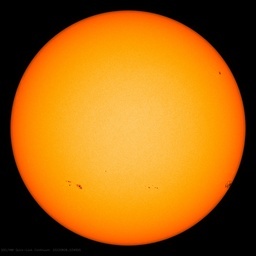 Or perhaps because of a deep solar minimum? 1. Earthquakes occur frequently around the minimum years of solar activity. Generally, the earthquake activities are relatively less during the peak value years of solar activity, some say, a round the period when magnetic polarity in the solar polar regions is reversed. 2. The earthquake frequency in the minimum period of solar activity is closely related to the maximum annual means of sunspot numbers, the maximum annual means of solar 10.7 cm radio flux and solar proton events of a whole solar cycle, and the relation between earthquake and solar proton events is closer than others. 3. As judged by above interrelationship, the period from 1995 to 1997 will be the years while earthquake activities are frequent. In the paper, the simple physical discussion has been carried out. Do not know about world wide but we do have the UK numbers: one report was 37,000 people died Here is another. “….Last year 36,700 more people died during the winter months than in the summer the worst level for almost a decade. Nope, they didn’t forget malaria. They even put Mike Mann in charge because they knew they needed some “creative” number crunching. Malaria had spread as far north as Siberia before modern times and SCREENS, mosquito repellent, insecticides beat it back. … I think people have a very poor understanding of what a 100-year flood plain actually is and the Army Corps of Engineers has a rather poor history of figuring it out accurately because river conditions, including amount of runoff, change over the years….. In my county it is even worse than that. I had to get a Army Corps of Engineers flood plain map of my area with the proposed house site marked. No problem. This was filed at the planning board so it was readily available. A good old boy inherited several hundred acres next to me and sold off 10+ ac lots. Many of the new houses are built right next to the river. (Dam down stream) I KNOW that the next time we have a big inland hurricane at least two of my closest neighbors will be underwater because I saw that land flooded over three feet deep or more all the way to the river when Hurricane Fran hit in 1996. I walked to the river just after the hurricane and everything from the creek running parallel to the river was flooded. We are talking about a 1/2 mile or so in distance between the high flood line and the river. It was right where the Army Corps of Engineers marked it too. Political pull trumps the common good. Note that the cement head who insisted I drive across the state to get that map is the SAME one who approved all the other houses. Therefore ignorance of the flood plain was not the problem. Thanks Gail but, I’m well aware this is just another trumped up story by the warmistas!! If, essentially the same people had not worked to get DDT banned there’s a good chance malaria may have been eradicated by now! Of course, that wouldn’t fit with the ultimate aim of the environazis. Population control. Building houses on flood plains is risky but a supply and demand issue – nothing to do with climate change – amazingly some in the insurance business seem to think it is. If severe weather events are on the rise due to (cough) Anthropogenic Climate Change then wouldn’t it be irresponsible for engineers approve the building of wind farms? and also, it is reported by the BBC and others in the UK that it will be more cloudy and rainy in the future, wouldn’t that make solar farms pretty useless too? I wouldn’t worry about this if policy makers were smarter than most people, but unfortunately there is no evidence that they are. Sparks: There are a lot of solar farms or at least solar houses in Vermont where it is rainy and snowy a lot. In sunny Florida you don’t see them that much. I think it is the political climate that determines how many solar panels you see rather that the weather climate. on TV where they were restoring large stately homes. One bloke reckoned he would never pay for gas or electricity age as he had erected heaps of solar panels on his large roof. Now they are removing subsidies in UK, that my prove and environmentally friendly option, but most expensive to operate. You see from my perspective, they rely on the main electricity grid. Doesn’t stop the generators from operating? And this guy admitted that in winter, and spring, it didn’t pay for itself. Always remember the target audience. In this case the report is directed at politicians, not people, and certainly not scientists. When you’re trying to convince a politician that things are worse than can possibly be imagined, say nothing, absolutely nothing. If you leave the “fine details” up to their imagination, you will justify your existance in a heartbeat. Lack of specifics, omissions, etc., lead to continued funding and budget increases inorder to answer those very same questions (which, of course are NEVER answered) so that they have you to blame for any delays and they are not accounted for these themselves. Never underestimate a politician, especially the super variety at the International Agency level. Oh, are they good! The IPCC has gone surly for some time; surely you know that!? !